British actor Benedict Cumberbatch is the newest member of the “Star Trek” franchise, but he assured Access Hollywood’s Scott Mantz, although he is the new “Trek” bad guy, he is not playing legendary villain Khan in the upcoming second installment of the origin series from J.J. Abrams. On Tuesday, Benedict did reveal, however, some new details to Access’ MovieMantz at the junket for the first nine minutes of the film, “Star Trek Into Darkness,” which was first screened for journalists over the weekend. The actor, who also stars as Sherlock Holmes in PBS’ “Sherlock,” admitted he wasn’t looking to see a “Star Trek” film when the origin story of the reboot franchise first came out. And Benedict noted the new film takes things even further. 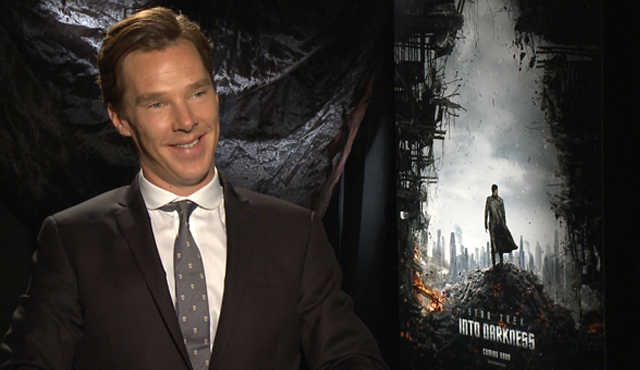 Benedict said he is aware this film is important to lifelong “Star Trek” fans, but he had to please his director, first and foremost. “You can’t try and fulfill everyone’s expectations. As an actor, my role in this is to fulfill my director’s promise in me and yeah, if I fulfill his trust in me, that’s it. That’s a job done. And then, I have full respect for the fans’ response. I know that they own this… A lot of people have grown [up] with this all of their lives… And that is important to me, but if you go about trying to please everybody, it’s a short way to madness. “It would paralyze you if you went to all of the comments… Having said that, I’ll be over the moon if the fans are happy,” he added. “Star Trek Into Darkness” hits theaters on May 17, 2013.